The current upheaval in global markets has many on Wall Street drawing comparisons to turmoil in 1998, 1987, and even 1929, but a new book suggests investors should look back as far as 1907 for insight into the mechanisms that can trigger a crash. 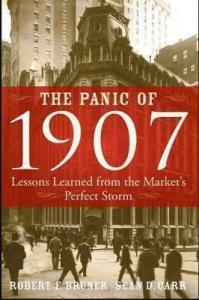 "The Panic of 1907" (Wiley, $29.95) begins with the Park Avenue suicide of Charles Barney, a prominent New York banker. Barney was one of many casualties -- both individual and institutional -- of an attempt to corner the market in shares of United Copper Co., which brought a string of banks to the brink of collapse. Authors Robert Bruner and Sean Carr illustrate the domino effect of the panic from the plunge in United Copper shares all the way to the bankruptcy threat for the city of New York. "The Panic of 1907" also paints a picture of the many conditions that made the economy vulnerable to such a brutal chain reaction. Timed to coincide with the 100th anniversary of one of the worst financial meltdowns in US history, the book's arrival on shelves in September is all the more fortuitous since even mom-and-pop investors are now aware of the volatility that has gripped Wall Street over the past few weeks. Some of the conditions that laid the groundwork in 1907 may look familiar to anyone who has read the business pages this year: a booming economy and unprecedented rash of corporate mergers and acquisitions and a profusion of "borrowers and creditors [who] overreach in their use of debt." "Credit anorexia" set in once "bank directors awoke to the inadequacy of their capitalization relative to the credit risks they had taken," causing them to cut off the new loans available to their clients. Soon afterward, long lines of panicked depositors were forming outside several banks waiting to withdraw their funds. Bruner and Carr, both professors at the University of Virginia, identify seven elements that can converge to create a financial "perfect storm," no matter what the century. Key among them is some kind of real economic shock. In the case of 1907, one of the shocks was the San Francisco earthquake the year before. If such a storm were to strike today, we wouldn't be able to identify the shock until after it hit, the authors point out. But one potential culprit they cite is the high amount of leverage used by hedge funds and their tight relationships with major banks, which could make any losses ripple through the financial system. In 1907, it was J. Pierpont Morgan who led the charge to stop the bleeding on Wall Street. Bruner and Carr credit the financial titan with putting his own firm's capital on the line to save smaller banks from collapse, compelling his counterparts to act as a collective to stave off contagion. One hundred years later, Bruner and Carr pose the question, does today's rapid, automated style of trading leave any room for such a cooperative rescue effort, should such a panic occur again?